The Leisure World Holiday Complex, with so many sports and games available, might be the holiday of a lifetime for some teens – but Daniel Lever certainly isn’t one of them. Dragged there by his dad, and feeling guilty over his role in his parents’ separation, Daniel’s expecting he’ll hate it, and his early experiences seem to suggest he’s right. Then he meets a mysterious girl who he’d like to know better – but why do her bruises keep getting worse, and does her watch really tick backwards? More worryingly, why can’t anyone else see her? 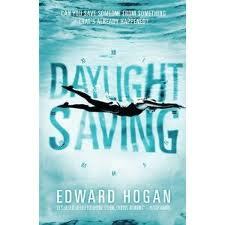 Adult author Edward Hogan makes his teen debut here with a real chiller. Capturing the central couple and the way their relationship develops brilliantly, he also keeps things tense and fantastically atmospheric right the way through this novel. It stands out as being really unique in its premise and Hogan makes the ghost parts work very well. I also found the way that Hogan gradually revealed more and more of Daniel's backgrounds, and the events which had led to his parents' separation, to be very well done. In addition, he has an extremely readable writing style, with his dialogue being particularly good. Special mention for the superb ending, which worked perfectly and was beautifully written. Even though Daniel was a really well developed central character and Lexi, the strange girl, was fantastic, Daniel’s father came close to stealing the entire book for me. I thought the way he handled – or struggled to handle – his split with Daniel’s mother was incredibly well done, and loved the way he and Daniel’s relationship changed as the novel progressed. Apart from anything else, it’s hard not to warm to someone who talks to tomato plants! High recommendation for this one, Edward Hogan is definitely someone whose future work I'll be keeping a close eye on. Great review. I enjoyed watching how Daniel's relationship with his father changed too & have to admit to laughing when the dad kept talking to the tomato plant!